iCOPE is an interactive digital screening platform that facilitates efficient and effective screening in the perinatal period (during pregnancy and year following birth). The platform was developed in response to the current recognised barriers to screening across services, together with the absence of data to inform the extent to which screening is undertaken and the outcomes of screening under Australia’s national perinatal depression initiative (NPDI). 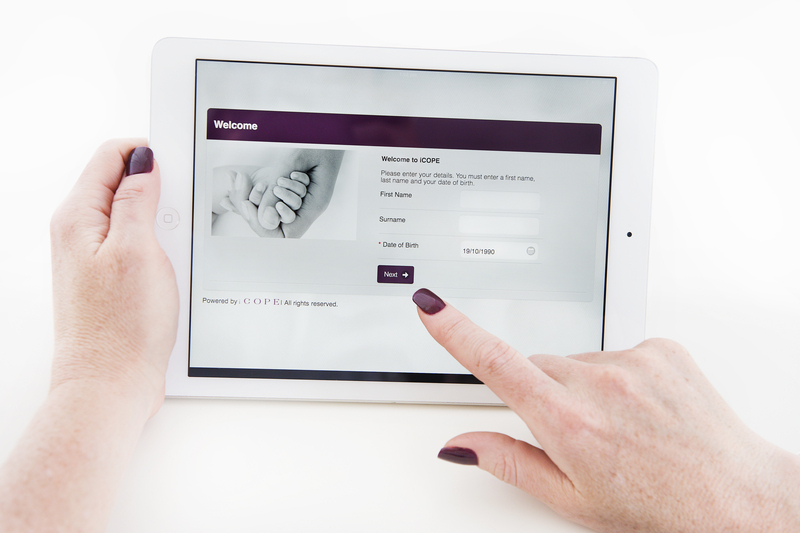 The platform enables screening to be undertaken by patients/clients on a tablet (e.g. iPad) and scores to be automatically calculated, interpreted and reported for both health professionals and consumers. In addition to its clinical application, the iCOPE platform also facilitates the collection and collation of patient data for research purposes. iCOPE is a web-based platform accessed by providing health professionals with an individual login and password into the iCOPE system. In consultation with the health practitioners and services, selected screening questions and questionnaires are loaded onto the digital platform. Symptoms of depression and anxiety – using the Edinburgh Postnatal Depression Scale (EPDS). In addition to the above, other questions or questionnaires can be included on the screening device to meet the needs of the population, service and/or specific area of research. In the 2017 upgrade now includes questions to ascertain if the client may be eligible for MBS items surrounding a Complex Birth (MBS Item 16552) as well as assess for the presence of symptoms and psychosocial risk factors, including drug and alcohol use and family violence, as required, to claim MBS Items 16590/16591 (antenatal) and Item 16407 (postnatal). The administration of questions on a tablet means that questionnaires can be completed in the waiting room or within a consultation. Summary scores and interpretations are calculated in real time and compiled into automated reports for both health professionals and patients/clients at the time of screening. The clinical reports for health professions provide summary information about the identified risk factors and summary scores on the EPDS, together with clinical advice in accordance with Best Practice Guidelines. The clinical reports are in PDF format, allowing them to be uploaded into the patient’s medical records on other software systems (e.g. Genie, ObstetriX, Birthing outcomes system (BOS), Medical Director, Best Practice). This provides efficiency whilst ensuring compliance with the MBS requirements (i.e. that results of the mental health assessment must be recorded in the patient’s medical record). The individualised reports for patients/clients provide information about the person’s identified risk factors and their likelihood of experiencing depression and/or anxiety. In addition, links to specific pages of the COPE website are embedded to provide further information that specifically relate to identified risk factors or clinical symptoms. Data for patients can be sent to their personal email accounts or sent via SMS to their personal device. The collection of data across sites enables summary data to be monitored and reported to inform service need. In addition, patient data can be collected over time (longitudinal) to inform changes in clinical status (monitor progress/treatment outcomes). To view a short sixty second iCOPE Screening video, click here. Saves time by enabling screening to be undertaken outside of the consultation. Produces automated clinician reports containing summary score data. Embeds best practice by ensuring the consistent and accurate interpretation of clinical scales in accordance with clinical guidelines. Provides tailored reports for consumers via email or SMS. These reports detail key personal risks and symptoms, as well as providing links to further information and support/treatment services. Enables screening questions and patient reports to be translated and delivered in multiple languages (N=13 languages currently). Automates the collection of identified patient data to provide sites with summary data regarding patient profiles, clinical status, etc., to inform service needs. Enables longitudinal collection of data so that patients can be monitored (and treatment outcomes assessed) over time. Enables the collection of de-identified data to inform research, policy and service provision at a state/territory and national level. Whilst the tablets can draw on wi-fi, it is advised that this is in-built into the tablet (via SIM card) to enable the screening to occur consistently and also be used off site as needed (e.g. on home visits). Tablets can be purchased or leased by the service and, if deemed necessary, electronic tracking devices can be located on the tablet. In the event of theft, this enables the tablet device to be disabled immediately and tracked. The iCOPE platform can be tailored to reflect the branding and specific reporting needs across individual services. This includes, for example, the inclusion of company branding on the screen. Data is collected and recorded automatically and in real time. Data is securely stored using secure messaging. This server-based approach protects sensitive data when sent beyond the corporate borders and provides compliance with industry regulations. Each site has its own ‘sandbox’ of data, which is essentially all collected information in relation to patients screened within that service. This data can be provided to clients to enable them to undertake their own analysis and research on their clinical/research populations. In addition, there is also the option to have summary reports produced by COPE. For more information about the iCOPE platform, please download the iCOPE Brochure. If you would like to receive a quotation to implement the iCOPE screening platform within your service, please complete and submit the online iCOPE Expression of Interest form.